Movado has been in the watch game a long time, marking out its place in the landscape of Swiss timepieces with that signature sundial. With the Movado Connect, it's making the jump to Android Wear, resulting in one of the more distinct offerings we've seen from the Google clan to date. This is all about style – Movado is sidestepping fitness and we're glad it has, rather than just shoehorning in some sensors for the sake of it. This isn't the type of watch you'd want to take on a run anyway, still less put through any other vigorous activities. Like the Louis Vuitton Tambour Horizon, Tag Heuer Connected Modular 45 and Fossil Q x Cory Richards, this is 100% about making a luxury smart timepiece, which goes for the Movado Group's other Android Wear watches, the Tommy Hilfiger TH24/7You and Hugo Boss Touch. Like the models mentioned above, Movado really wants to stamp its signature on Android Wear, and that seeps beyond the design and into the software. The result? Read on and find out what we made of the Movado Connect. 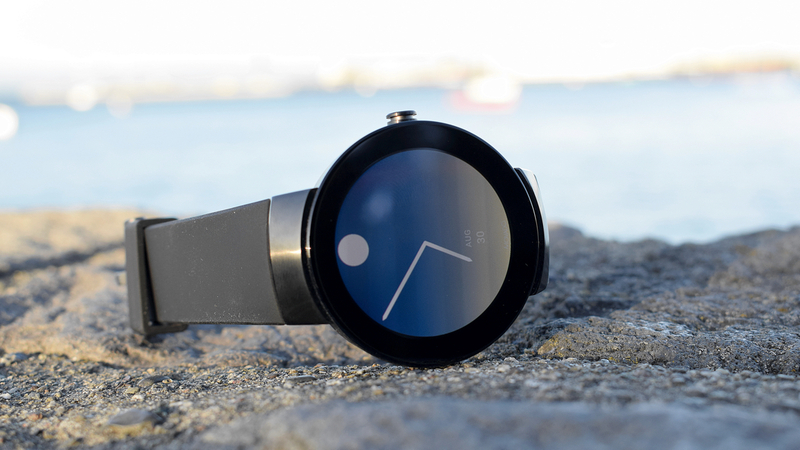 This is Movado's first Android Wear watch, but not its first smart one. It previously built the Movado Bold Motion, hand in hand with HP, but now with a proper screen Movado is able to try things it was never able to in analogue format. Naturally that includes some faces, making use of its iconic dot at 12 o'clock, while the rest of the watch keeps a very clean, slick look. There is plenty of bezel here, but the edge-to-edge glass does it a favour and obscures it when the display is off, much like the Apple Watch does. The Connect comes in different materials – silver, and gold with black lugs – as well as different straps. While the black has a little more of a techy look than the others, the Movado is still one of the most stylish Android Wear watches you can buy right now, no matter which model you opt for. The 46.5mm case means the Connect occupies a lot of wrist space, though it doesn't feel as overbearing as the LG Watch Sport or even the Samsung Gear S3 – though if you're in the market for a high-class Android Wear watch and money isn't too much of an object, the Louis Vuitton Tambour Horizon has a bit less heft. But Movado has delivered an Android Wear watch that feels like a Movado watch, which is more than we can say for some manufacturers. So kudos on that. Meanwhile the 400 x 400 resolution display is perfectly vibrant, and if you're not tapping that then there's a single button on the side between two microphones for talking to Google Assistant or taking calls. Sadly once again, Android Wear 2's rotational input isn't being taken advantage of, so the button is just for pressing, not scrolling. Where Movado really makes its smartwatch stand out is in the watch faces. There are loads of dial variations to choose from, some of which have the 12 o'clock circle of Movado's most famous Museum Watch, representing the sun at high noon. It even stays visible when the screen is dimmed. Even better is the Cyclox face, which combines hands and numbers in a way that just wouldn't be possible on an analogue timepiece. There's an undeniable beauty in the way this is animated on the display, but I've also enjoyed using a more basic face that changes colour depending on the time of day, from dawn till dusk. Whichever is your pick, it's in these faces that Movado is taking advantage of the new technology and doing some genuinely interesting things with it. Because beyond that, you're looking at your basic Android Wear affair. That also means the fitness offerings are pretty bare, as the Connect doesn't have a heart rate sensor or built-in GPS. Movado's not so concerned by this area, and that makes sense; sticking on a HR sensor for the sake of it probably isn't going to net Movado many more users. After all, this is a $595+ smartwatch, so chances are you're not buying it for access to Google Fit. It's also water resistant, but not enough to take for a dip in the pool. One other big string to Movado's bow, however, is Android Pay. Until Google makes this a necessary inclusion on Android Wear watches (and I think it should if it wants it to be taken seriously) many manufacturers are eschewing the feature. Not Movado though, which will let you pay with a tap of the wrist. As for navigating all of this, I found that it ran as sprightly as any of the other Wear watches running Qualcomm's Snapdragon Wear 2100 as I jumped around Google's operating system. Movado promises a day of battery life, and I've found myself getting to bedtime with a bit of battery still in the tank, but never enough to really stretch it to two days. With no heart rate sensor or GPS, you're only going to risk running down the charge dramatically if you're interacting with the watch a lot, but otherwise you'll have no problem getting through the day before needing to stick it back on its cradle. That's par for the course with Android Wear right now, even on a watch like this that's in the more expensive brackets. The Connect isn't dramatically different to the rest of the Android Wear crop, but the design and watch faces make this distinctly Movado. It's expensive, but that's hardly surprising from this watchmaker, and you can be sure you're getting one good looking (if a little large) wearable. Android Pay meanwhile helps round out the features, while Movado takes advantage of the smarts for some interesting watch face ideas.